Essentially there are two types of safety glass that we use at Nu-Line Windows. 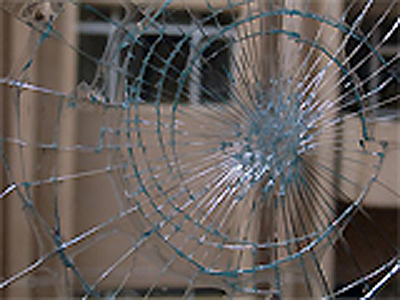 The first type of safety glass is known as laminated glass which, when broken, holds together (see image below – note the characteristic ‘spider web’ cracking pattern). It has these breaking qualities because this type of glass is really two pieces of glass that are held together by a clear polyvinyl butyral (PBV) interlayer. This type of glass is often used in shopfronts to prevent any potential burglars from getting easy access to inside. It is also readily available and easy to cut to size. As such, it is generally the glass type that we use as standard. The second main type of safety glass is called toughened glass (sometimes referred to as tempered glass). This type of glass goes through a controlled thermal process which makes the glass substantially stronger (up to five times) when compared to regular glass and really requires a significant force or very sharp object to break. When this type of glass is broken it shatters into tiny little pieces (see image below) and is less likely to cause personal injury. These types of glass are used to form tinted, patterned, performance (low E) and double glazed glass. They are also available in different thicknesses, but Nu-Line will ensure that the glass meets the relevant Australian standards. Stay tuned for more information about glass energy and noise performance. Nu-Line Windows are experts in glass so if you have any questions please don’t hesitate to ask.